Prepare rice noodles in boiling water per package instructions. Drain and set aside. Make the peanut sauce by whisking all sauce ingredients in a small mixing bowl. To assemble spring rolls, pour very hot water into a shallow pan or skillet and immerse the rice paper to soften for about 10-15 seconds. Transfer to a damp cutting board or clean, damp countertip and gently spread out edges into a circle. This can be tricky! Add a small handful of vermicelli noodles to the bottom third of the rice wrapper. Place a few carrots, peppers, cucumber, a few mint leaves and some cilantro and 2-3 shrimp on the noodles. Carefully fold over once, tuck in the edges, and continue rolling until seam is sealed, as you would roll up a burrito. Place seam-side down on a serving platter and cover with damp towel to keep fresh. Repeat until all fillings are used up. 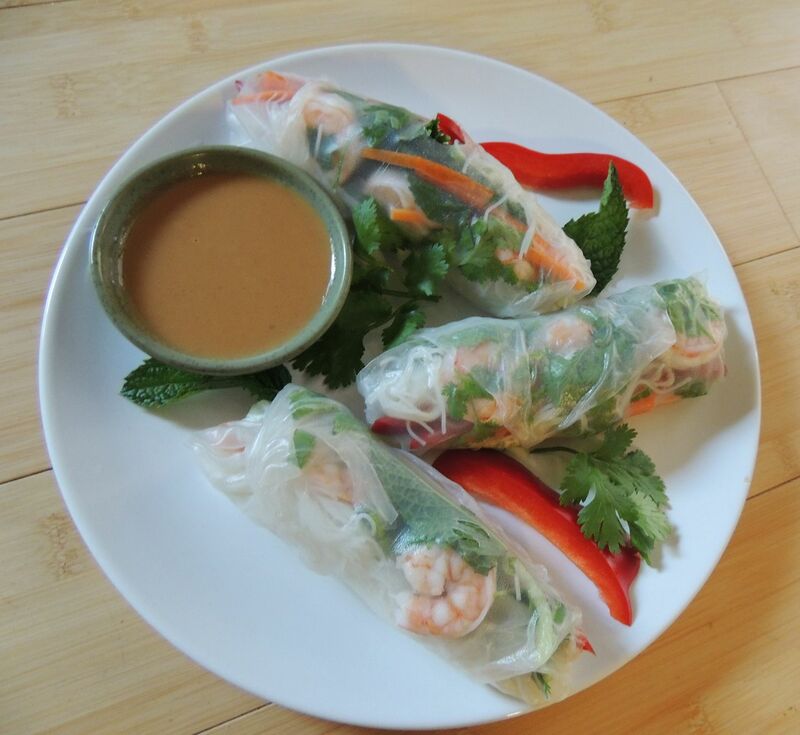 Serve immediately with peanut sauce.